Last evening, the Cubs let folks know that hitting coach Chili Davis, hired just last year, would not return to the club in 2019. Given what team president Theo Epstein said at his season-ending press conference, the decision was not a shock. “Here’s where I am about the offense. I mean this with no disrespect to our players, I respect them all greatly in every way, and our coaches and our front office and everybody involved. There’s no disrespect, but I think part of getting better is facing the problem. Our offense broke somewhere along the lines …. The bottom line is we stopped walking and stopped hitting the ball out of the ballpark, especially in the second half. We hit the ball on the ground a ton, I think that was exacerbated [at the end] probably by a little of the stuff the guys had to deal with, the schedule and the fatigue. But it started long before that, so it’s not an excuse …. I wouldn’t say [we were] ‘caught in between [philosophies],’ but I think still evolving. Still evolving. If we were still caught in between approaches, why were we the best offense in baseball in the first half? So I do think something happened in the second half and especially down the stretch that, as demonstrated most poignantly and painfully in these last few games, that we have to get to the bottom of …. I appreciate that the front office was seeing what we were seeing, and I appreciate the willingness to make a significant change immediately. Whether Davis actually deserves to wear this blame, we will probably never know. But we do know that the front office (together, presumably, with input from Joe Maddon) went out of its way to make the change from John Mallee to Davis, so, if it was not working out, it was on the front office to admit it, and then promptly make a change. They did not have to make the hire in the first place. But, once made, and once 2018 played out, they had to let Davis go. 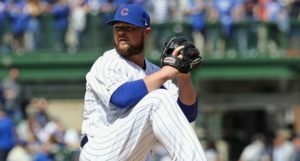 The Cubs wanted a more all-fields, high-contact, line-drive approach this year – a philosophical change that made many of us nervous at the outset – and, in many ways, they got exactly what they wanted. 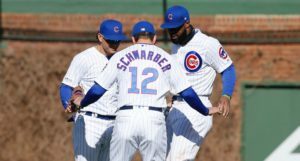 Still, the flaws in the plan were showing as early as May and June, as the Cubs’ power totally disappeared. This was not solely a second half problem – it’s just that the results were even worse in the second half, transforming the obviousness of the problem from being knocked over the head by a frying pan to being knocked over the head by an SUV. And if the power evaporates in the process of improving the all-fields, high-contact approach (the team’s ISO shrank to .152, tied with the Orioles for the 8th lowest mark in baseball), then you’ve got to be insanely high-contact, insanely productive with runners on base, and insanely good with two strikes to make up for it. Alas: the Cubs’ 21.8% strikeout rate was just 11th best in baseball this year. The Cubs’ 99 wRC+ with runners on base was 17th. The Cubs’ 42 wRC+ in two-strike counts was 20th. 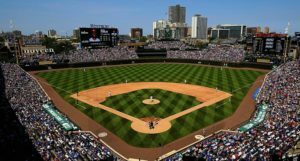 The Cubs made significant changes to the way their bats operate, and even in the areas it was supposed to improve (at the expense of power), they were mediocre at best. That’s not something that keeps the status quo in place. Terrible year-to-year changes, terrible results, and terrible feedback? That’ll do it. Of course, to that end, it would be unfair to act like this is all on Davis and the front office. The players are still professionals, largely in charge of their own development as hitters, and too many of them did not develop this year. Yes, that’s partly a debit to the organization charged with helping them get there, but it’s not like the players would exclude themselves from the process. After all, if a guy breaks out, it’s not as if any single coach will get all the credit. Example: Davis undoubtedly deserves some credit for his work with Javy Baez this year, but most of the credit goes nowhere else but to Baez, himself. The players still have to actualize the instruction they’re getting. Nevertheless, that instruction still has to mesh with the players. For Davis and the Cubs, clearly something wasn’t meshing, and the cracks got too big to ignore by the time the offense slumped its way through August and September. Whether you want to call Davis a scapegoat or want to castigate the front office for making the hire in the first place, I say you do you. For me, I don’t want to miss the most important point, and it was the one Epstein underscored at his press conference: what the Cubs tried to do this year did not work. The offense flat out broke, in a very dramatic, comprehensive way. A collection of talent like this should not have the kind of second half that the Cubs did. Fundamental changes were necessary, and it’s hard to imagine it making any sense for Davis to be one of the primary voices in making changes to the very things he’d tried to instill the year before. So, then, Davis is out. He did the best he could with the charge he was given. It didn’t work. Learn from it, make another change, and find the right fit for this group – in person and in philosophy. Change to player personnel is, of course, also going to be a consideration in this matter, but that doesn’t come until after the postseason is over.